Many products in the Fashion apparel categories of bottoms, dresses, jackets, sleepwear, and tops are available in both Misses’ and Women’s sizes. Avon Intimate apparel and Casualwear sizes are best suited for heights 5’4”-5’7-1/2”. Misses’ sizes are generally available in SMALL (6/8), MEDIUM (10/12), LARGE (14/16), XL (18). Women’s sizes are generally available in 1X (18W/20W), 2X (22W/24W), 3X (26W/28W). To find your size, measure around the bustline, waist, and hips. Bust/Chest: With the measuring tape under your arms, measure the fullest part of your chest. Waist: Measure around your natural waistline while keeping the tape measure close, but not too tight. Hips: Keeping your legs together, measure below your waist at the fullest part of your body. Starting in C-6, mark. fashion apparel will have more inclusive size — from XS – 3X! mark. by AVON is not about age, it’s about attitude. Now more customers can wear our popular mark. styles. Mark fashion apparel is now available in Extra Small (XS 0-2), Small (S 4-6), Medium (M 8-10), Large (L 12-14), Extra Large (XL 16), Plus Size (1X 18W/20W), (2X 22W/24W), (3X 26W/28W). Mark fashion apparel uses junior sizing, which runs differently than misses sizing. Take a snug measurement around your rib cage, below your bust and shoulder blades. Then add 4 inches. If you get an odd number (like 35), round up to one (to 36). With a bra on and clothes off, measure around the fullest part of your bust. Compare bust measurement to band measurement. Subtract the band measurement (Step 1) from the bust measurement (Step 2). Then use the chart below to determine your cup size. NOTE: Intimates are Representative Delivery Only. Contact me for assistance in finding the style and size you need, and to make arrangements for shipping. Do your bra straps cut into your shoulders? If so, you may be over-tightening the straps. Loosen them to relieve the strain. What is the advantage of an underwire? Underwires help relieve shoulder stress from bra straps by adding support below the breast. Underwires also provide shaping, for an attractive lift and look. Does your bust spill out over the top of your bra or bulge under the cups? If so, your bra cups are too small; go up one cup size (but be sure to keep the same band size). Do you have wrinkles in your cups at the top or sides? Then your bust is not filling out the cup properly; try a smaller cup size. Is your underwire uncomfortable? The underwire should gently surround your bust and should not pinch or poke. If it does, try a larger cup size. Does the back of your bra ride up higher than the front? If so, your band is too loose, you should tighten the band and loosen the straps. If that doesn’t help, you should try a smaller band size. Remember the lower the back of the bra fits, the more support you get. How do you prevent your bust line from sagging? Try shortening the straps; if your bust line still sags you may need a smaller cup size or try a firm support style with rigid straps. Does the band of your bra dig in? A bra that fits correctly should be snug but not tight. Try a larger band size or a bra with a wider band. What if one of my breasts is larger than the other? This is a common problem among women. Always fit the larger breast. Choose styles with stretch fabric in the cups or padded cups. You can also adjust the strap of the larger breast looser than the strap of the smaller breast. What is the best way to put on shapewear? Gather the garment from the legs to the waist. Step into the legs and pull up. When the bottom is seated correctly, unroll the garment over the torso. How often should you be fitted for a bra? You should be fit for a bra at least once a year. You should also be fit if you gain or lose weight, during pregnancy, after childbirth, during menopause and if you begin an exercise program. How should you care for your bras? Do use a gentle detergent, and wash in cold water. Do fasten the hooks, and use the lingerie wash bag. Do store bras properly — fold them I half with one cup inside the other, or stack them in a row. Don’t put in the dryer. When should you replace your bras? When the color changes: White bras will turn gray, dark colors start to fade. When the fabric stretches out: Band may not feel as tight as it used to, and it may ride up in the back. Straps may slip off your shoulders even after adjusting. When the fabric looks worn: You risk getting jabbed by the underwire, and once the fabric starts getting threadbare, your chances for show-through increases. When it’s too tight or too loose: Your bra may be in perfectly good shape but maybe your figure has changed due to weight loss, childbirth, or surgery. 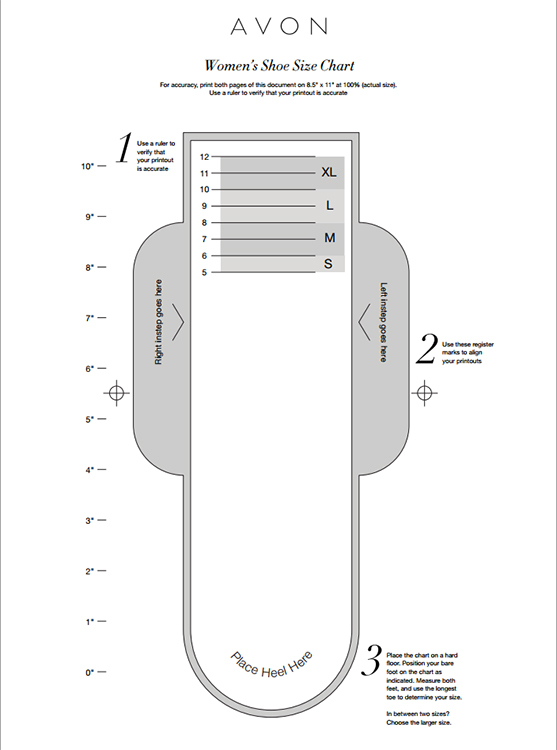 Download and print out the Women’s Shoe Size Chart. For accuracy, print both pages of this document on 8.5″ x 11″ at 100% (actual size). Use a ruler to verify that your printout is accurate. Place the chart on a hard floor. Position your barefoot on the chart as indicated. Measure both feet, and use the longest toe to determine your size. In between two sizes? Choose the larger size. Download the Avon Ring Sizer to help find your ring size. Set your printer to 100% before you print. Match circle with the inside of one of your rings to find the size of your new Avon Rings. Avon is an industry leader in quality control testing. Our products have superior tarnish resistance, color-fastness, and durability under normal wear. Avon Jewelry is worry-free for sensitive skin. We adhere to the highest international lead and nickel safety standards. Avon proudly offers one of the highest quality metal painting standards in the industry.